'This time around, no US envoy flew down to Delhi -- not even when tensions spiked and a flashpoint was reached last week,' points out Ambassador M K Bhadrakumar. With the India-Pakistan standoff somewhat waning, the time is ripe to put under the scanner the stance taken by the Trump administration through the crisis situation developing since the February 14 terrorist attack in Pulwama. On the face of it, Washington was strongly supportive of India. United States National Security Advisor John Bolton reportedly rushed to contact his Indian counterpart Ajit Kumar Doval twice in the immediate aftermath of the Pulwama attack. The US also made its oft-repeated call to Pakistan to shut down terrorist camps. But a highlight was that Bolton publicly upheld India's right to 'self-defence' following Pulwama. This is a standard US formulation that Washington routinely reserves for its ally Israel in anticipation of the inevitable Israeli military reaction to any provocation by the Palestinians or Hezbollah -- and, more recently, in the situation surrounding the Syrian conflict. However, Bolton's exuberance remains an enigma. Bolton has been accused of being a maverick, an inveterate hawk and as Israel's sidekick. But he is an intelligent man. Didn't he know that Israel exercises its 'right to self-defence' selectively against hapless weak targets, whereas India's adversary is a Nuclear Weapon State with proven capability to retaliate? Did Bolton have any inkling that an Indian escalation was in the making days or weeks ahead? Or, did he make that intriguing remark by way of winking at India and prodding it to go for some sort of action against Pakistan? Importantly, did he have Israeli inputs? After all, Bolton is wired into the Israeli political establishment -- and vice versa. He secured his White House job with Israeli help and he is mindful of that at all times. This is important because the Indian security establishment and ruling elite too has close links with Israel. The well-known Middle East analyst and author Robert Fisk, who is immensely experienced in the Islamist insurgency, wrote recently that the Indian security operations in J&K lately bear striking similarity to the methods practised by the Israeli forces in Gaza and the West Bank to bludgeon the Palestinians into abject submission. He estimated that India is virtually copying Israeli methods to quell mass unrest. At any rate, Bolton's reaction was exceptional insofar as traditionally, the US tried to tamp down tensions whenever a crisis situation arose and even used to depute officials from Washington to travel to Delhi to counsel restraint. This time around, however, no US envoy flew down to Delhi -- not even when tensions spiked and a flashpoint was reached last week. Of course, the US knows Pakistan cared two hoots for any exhortations/demands by Washington in the past to clamp down on terrorist groups operating from its soil and there is no likelihood of Pakistan listening today. If anything, today the US capacity to leverage Pakistan is at an all-time low. Yet, Washington made loud noises in that direction at various levels, including by Secretary of State Mike Pompeo. What did the US hope to achieve? One possibility is that it suited Washington if India increased its pressure on Pakistan at a juncture when the US-Taliban negotiations are at a critical stage and Islamabad's cooperation becomes vital. On the other hand, it is known now that US CENTCOM chief General Joseph Votel was in touch with Pakistani army chief General Qamar Bajwa. (Other Western military leaders also contacted Bajwa.) In sum, Washington kept a sharp eye on the India-Pakistan tensions and probably assessed that the chance of tensions cascading uncontrollably was remote. It was extraordinary that Trump began the press conference with the above 'breaking news'. 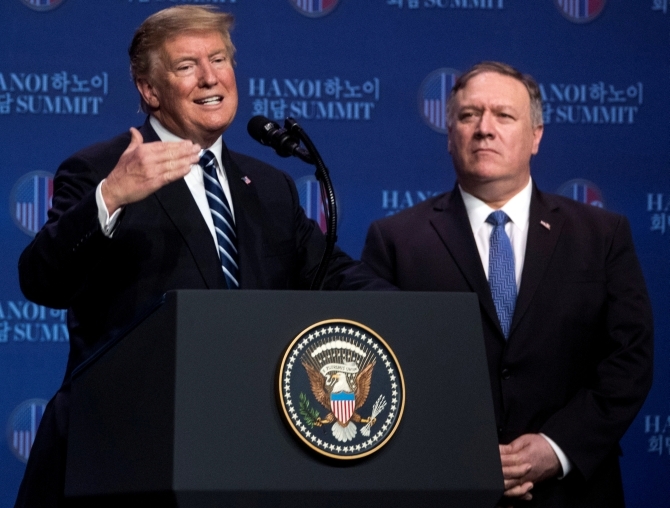 In all likelihood, he wanted to distract attention from the dismal failure of his summit meeting with North Korean leader Kim Jong Un by flagging a success story and, typically, to claim personal credit for it. This reference is extremely worrisome -- especially, since Trump also touched on US mediation. True, Trump avoided using the 'K' word outright, but he all but implied that the present tensions are to be traced to the unresolved seven-decade-old Kashmir problem. In retrospect, did the US really play an effective mediatory role in easing the tensions last week? It is hard to say because there was no overt diplomacy on its part (which is, by the way, very uncharacteristic of American diplomacy in such situations when an opportunity presents itself to project the US as the indispensable world leader). One thing is for sure. Increasingly, through thick fog that still surrounds the dramatic happenings last week, it seems that there was something highly contrived about the India-Pakistan tensions. The IAF was keen on crossing the LoC to bomb the target last Tuesday, but it was decided that it should only fire the PGM (precision-guided munitions) 'from Indian side of LoC' and, therefore, no IAF aircraft crossed the LoC and as per radar data reviewed by the IAF, the closest Pakistani aircraft was at a distance of about 120 km. Simply put, while the US tried to milk propaganda mileage out of the crisis, the highly sophisticated American spy satellites in place over the subcontinent would have given the White House an accurate account of what really was happening on the ground. The crux of the matter is that the US patently 'outsourced' the denouement to this brawl to its allies Saudi Arabia and the UAE. It could only have been Bolton's brainwave (at Israeli suggestion) to bring in the sheikhs who are the US's key allies in his pet project to encircle and destroy Iran. The US calculation is that with the Saudi and Emirati crown princes having virtually cemented Pakistan's induction into the 'Arab NATO' in the recent months, a golden opportunity was at hand to co-opt India as well. In the final analysis, if Delhi can be progressively weaned away from its relationship with Tehran, that will make the encirclement of Iran complete and Bolton's Iran project takes a great leap forward.